All events are open to the community with RSVP or tickets required and unless noted, will take place at the Reba and Sam Sandler Family Campus, 5000 Corporate Woods Drive, Virginia Beach. For more information about the Festival, to sponsor, or volunteer, contact Callah Terkeltaub at 757.321.2331 or CTerkeltaub@ujft.org. On happy occasions we wish each other “mazel tov” and when we want something good to happen we hope that we have a little “mazel” or luck. But good luck doesn’t just drop from the sky. People have more control over their futures than they sometimes realize. 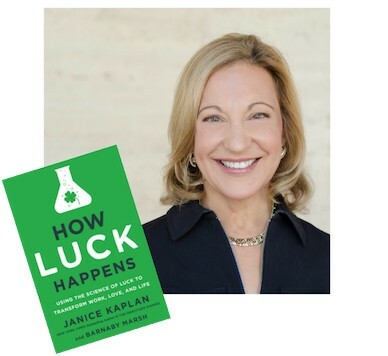 It turns out that luck occurs at the intersection of chance, talent, and hard work, and this helpful and entertaining book offers breakthrough insights on how a person can create more luck in love and marriage, career, health, and family relationships. The former editor-in-chief of Parade magazine, Janice Kaplan is the author of fourteen popular books, including The New York Times bestseller The Gratitude Diaries, which received international praise. Kaplan was deputy editor of TV Guide magazine and executive producer of the TV Guide Television Group, where she created and produced more than 30 television shows that aired primetime on ABC, FOX, VH1 and other networks. In addition to her popular nonfiction works, she has written hundreds of articles for national magazines and has enjoyed wide success as a magazine editor, television producer, writer, and journalist. 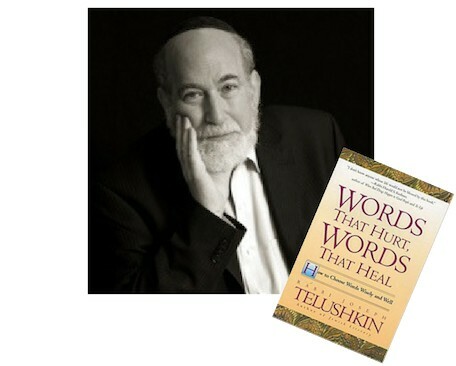 Rabbi Telushkin has long regarded Words that Hurt, Words that Heal: How the Words We Choose Shape Our Destiny as perhaps the most important book he has written. Few – if any – things impact one’s own self-image and the image of others as the words chosen and spoken. This is a thoroughly reworked and updated version of a classic work first released over twenty years ago, before the age of the internet. Drawing on the rich Jewish tradition of laws concerning fair speech, Words that Hurt, Words that Heal is truly a book that can change lives, starting with your own. And starting today. Minimal cost for some events to cover food. After a lifetime of marriage, Marcy Hammer is ready to get herself unhitched—just as everyone else in her life is looking for a commitment. Her new boyfriend, Jon, wants to get serious, and her soon-to-be ex-husband, Harvey, is desperate to get back together. When her headstrong daughter announces a secret engagement to Harvey’s attorney, Marcy finds herself planning her daughter’s wedding as she plans her own divorce. Husbands and Other Sharp Objects is a heartwarming, hilarious novel for anyone who has ever had a family. 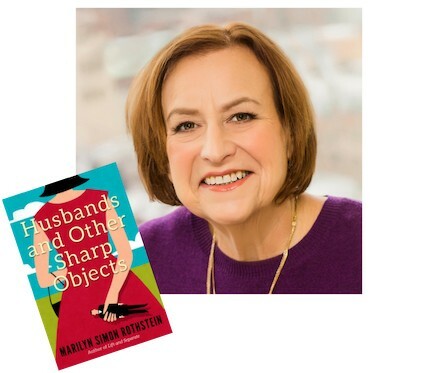 Marilyn Simon Rothstein is the author of Life and Separate, winner of the Star Award presented by the Women’s Fiction Writers Association for Outstanding Debut. Marilyn has a degree in journalism from New York University, began her writing career at Seventeen Magazine, and owned an advertising agency for more than twenty-five years. Deadline for bundled registration is Friday, March 15. In celebration of JCC Senior Book Club’s 100th read. Book members, click here to register. For more information about joining the book club**, please contact Callah Terkeltaub at cterkeltaub@ujft.org. The Parsha Posters project utilizes a bold, graphic aesthetic to tell biblical stories in a surprising new way. Inspired by modern minimalist graphic design, these 54 illustrations embody the emotions and characters of the parshat hashavua (weekly Torah portion) in a contemporary visual language. They also incorporate innovative Hebrew typography: each poster cleverly integrates the Hebrew name of the parsha into the design. Taken together, these images offer a cutting-edge vision of engagement with the Torah. 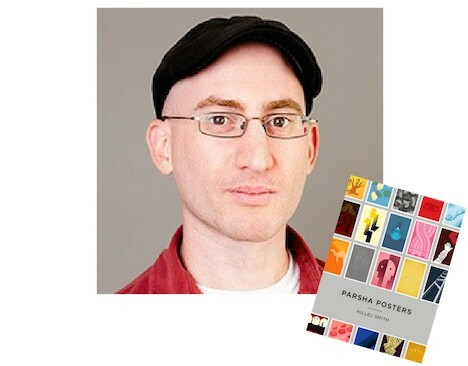 Parsha Posters includes the whole series, printed in vibrant color, with each illustration presented alongside the original translation of the biblical verses it portrays. The book is a window to a fresh understanding of our sacred text, a starting port for creative approaches to Torah learning, and proof of the potential of Jewish tradition to remain relevant and compelling today. Hillel Smith is an artist and graphic designer reimagining the potential of Judaica by utilizing contemporary media to create new manifestations of traditional forms. Smith has painted dynamic Jewish murals around the world, and his myriad of physical and digital projects encourage creative reconsideration of religious practice, and art-making as a tool for cultural connection. All 54 posters will be on display in the Leon Family Gallery at the Simon Family JCC during the month of February. 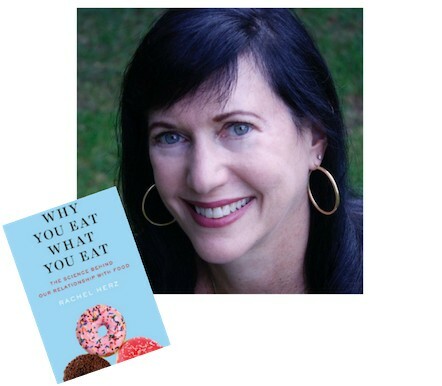 In Why You Eat What You Eat, acclaimed neuroscientist Rachel Herz examines the sensory, psychological, neuroscientific, and physiological factors that influence our eating habits. Uncovering the fascinating and surprising facts that influence food consumption and revealing useful techniques for improving our experience of food, Herz weaves curious findings and compelling facts into a narrative that tackles important questions. Herz reveals how psychology, neurology and physiology shape our relationship with food, and how food alters the relationship we have with ourselves and each other. Rachel Herz is a neuroscientist specializing in perception and emotion. She teaches at Brown University and Boston College, and is a professional consultant. The author of The Scent of Desire and That’s Disgusting, Herz is a world-renowned expert on the psychology of smell and believes that scent is the Rosetta stone for understanding emotion. In Sadie’s Almost Marvelous Menorah, Sadie accidentally breaks the Hanukkah menorah she made her mother in school. Sadie is devastated about the menorah shattering until she realizes that the shammash candle remains unbroken after the fall, and a new family tradition is born. In Sadie’s Snowy Tu B’Shevat, Sadie wants to plant a tree for Tu B’Shevat but it’s the middle of the winter! Her parents and grandfather assure her that a tree can’t take root in the frozen ground, but with help from her brother Ori and Grandma, Sadie learns why the tree-planting holiday is celebrated in winter and finds her own special ways to celebrate. 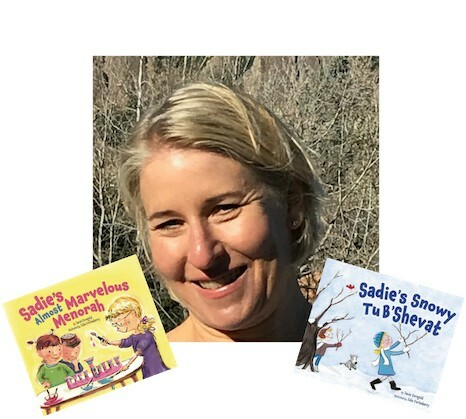 Rabbi Jamie Korngold is the author of 11 books, including the beloved Sadie and Ori series. She is known as the “Adventure Rabbi” bringing her innovative take on Judaism to students around the world via AdventureRabbi.org, the online school she founded in 2003. Rabbi Korngold is a regular on the Jewish Book Council tour, known for her engaging style and enthusiastic presentations. She lives in Boulder, Colorado with the real Sadie and Ori and all of their stuffed animals. Moe Berg is not a typical baseball player. He’s Jewish, which is unusual for the major leagues in the 1930s, has a law degree, speaks several languages, and loves traveling the world. He also happens to be a spy for the U.S. government, and when World War II begins, Moe trades his baseball career for a life of danger and secrecy. 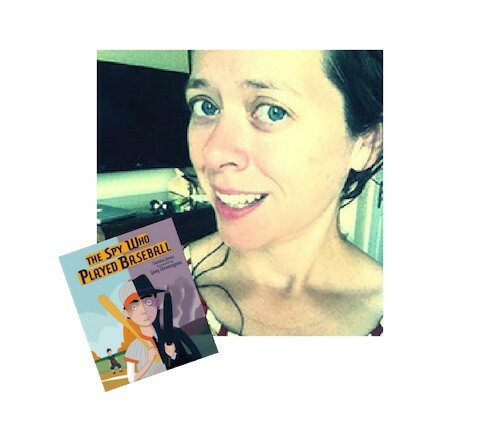 A picture book for both sports and spy lovers, The Spy Who Played Baseball is also about a Jewish immigrant’s son using brilliance and persistence to adapt to his new culture. Carrie Jones is a quirky, internationally and New York Times bestselling author from Maine who longs to save the world, somehow. She’s been an award-winning editor, photographer, a Rotarian public image expert, and on call firefighter, but her favorite thing is story. She’s fond of rescue dogs, gentle pets to the head, and people who do good in the world. Jones is the founder of the Bar Harbor Kids Book Festival, which brings authors and illustrators to the Mount Desert Island community for two full days of school visits, public appearances, contests, and interactions with both kids and adults. Generously funded by the United Jewish Federation of Tidewater and the Tidewater Jewish Foundation, in partnership with One Happy Camper. For more information on the weekend with Rick Recht, visit JewishVA.org/Latkepalooza. Set in 1965 Manhattan, The Lost Family follows Auschwitz survivor, Peter Rashkin’s life as a restaurant owner after the Holocaust. His work consumes him, as does his terrible guilt over surviving Auschwitz while his wife, Masha—the restaurant’s namesake—and two young daughters perished. Then exquisite June Bouquet, a young fashion model, pierces his guard. The two begin a passionate courtship and when June becomes pregnant, Peter proposes, hoping a new family will help him relinquish the past. But over the next twenty years, Peter’s indelible anguish haunts him, June, and their daughter Elisabeth, transforming them in shocking, heartbreaking and unexpected ways. The Lost Family features a husband devastated by grief he cannot voice, a frustrated wife competing with a ghost she cannot banish, and a daughter sensitive to the pain of her family and another lost before she was born. Spanning three cinematic decades, The Lost Family is a charming, funny, elegantly bittersweet study of loss and love. 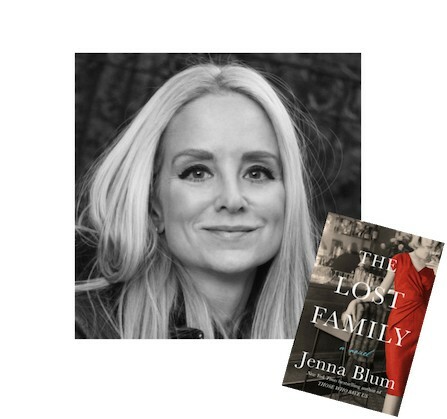 Jenna Blum is The New York Times and internationally bestselling author of novels Those Who Save Us and The Stormchasers and the novella “The Lucky One” in the collection Grand Central. Blum’s novels have been published in over 20 countries and she is one of Oprah’s Top Thirty Women Writers. She interviewed Holocaust survivors for the Steven Spielberg Survivors of the Shoah Foundation for five years, and teaches at Grub Street Writers in Boston, where she has been running master fiction and novel workshops for over twenty years; she earned her M.A. in Creative Writing at Boston University and was the fiction editor for AGNI Literary Magazine. For many, having a grandchild is the chance to become the parent they didn’t have the time or energy to be with their own children. Wonderfully intimate, psychologically astute, and often humorous, Isay’s Unconditional Love is an emotional guide to being a grandparent. Building on her personal experience, dozens of interviews, and extensive psychological research, Isay shows how a grandparent—though no longer in charge—can use his/her unique perspective and experience to find a way to keep the love flowing. 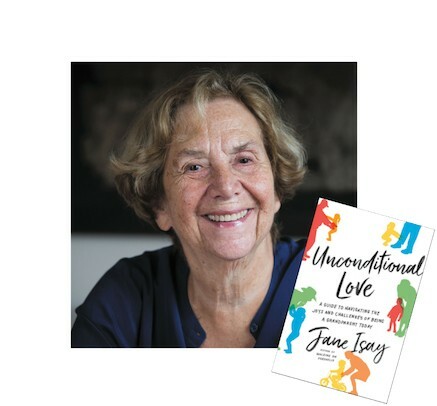 Jane is the author of three previous books: Secrets and Lies, about family secrets and revelations; Walking on Eggshells, about parents and their adult children; and Mom Still Likes You Best, about adult siblings. As an editor for more than forty years, she discovered Mary Pipher’s Reviving Ophelia, commissioned Patricia T. O’Conner’s bestselling Woe Is I and Rachel Simmons’ Odd Girl Out, and edited such nonfiction classics as Praying for Sheetrock and Friday Night Lights. 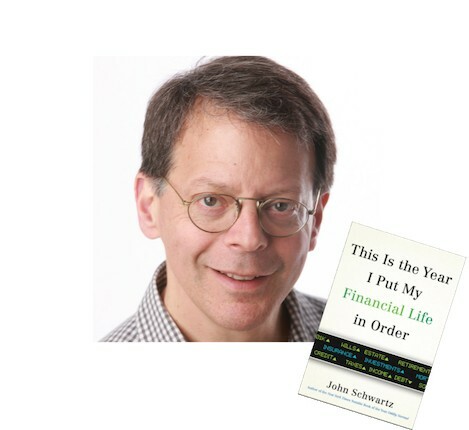 John Schwartz used to think that he’d grow up to be a financial maven. At 13, he put his bar mitzvah money into IBM. Soon after, the stock tanked, and John realized he was no money genius. Flash forward to his late 50s, and he hadn’t gotten much smarter; he had no idea whether he and his wife had enough saved for a comfortable retirement, or whether there was enough life insurance. They didn’t even have a will! Schwartz set out to finally learn about money, and realized that while many people avoid thinking about it, financial planning can be learned, like just about anything else. Part financial memoir and part research-based guide to attaining lifelong security, This Is The Year I Put My Financial Life in Order is the book that everyone who has never wanted to read a preachy financial guide has been waiting for and a key resource for parents wanting to pass down financial knowledge to their children. No matter what your age, situation, or status, This Is The Year I Put My Financial Life in Order will help you become your own best financial adviser. John Schwartz is a reporter at The New York Times, where he has written about science, business, law, and many other topics that have taken him from the Mojave Desert, to Moscow, and to New Orleans after Hurricane Katrina. He also writes a quarterly humor column on mutual funds and investing for the Times. Israel is playing a disproportionate role in helping solve some of the world’s biggest challenges by tapping into the nation’s soul: the spirit of Tikkun Olam, the Jewish concept of repairing the world. Thou Shalt Innovate profiles 15 wondrous Israeli innovations that are collectively changing the lives of billions of people around the world and explores why Israeli innovators of all faiths feel compelled to make the world better. This is the story of how Israelis are helping to feed the hungry, cure the sick, protect the defenseless, and make the desert bloom. 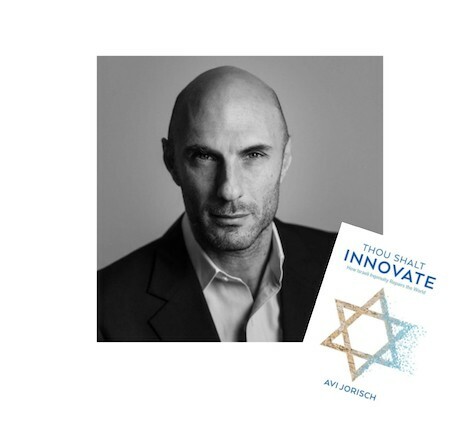 A thought leader in exploring global innovation trends, the Arab world, counterterrorism, and illicit finance, Avi Jorisch previously served in the U.S. Departments of Treasury and Defense. He is a seasoned entrepreneur and Middle East expert, Senior Fellow at the American Foreign Policy Council, member of the Council on Foreign Relations and the Entrepreneurs’ Organization, author of five books and has had articles published in New York Times, Wall Street Journal, Foreign Affairs, Forbes, and Al-Arabiya. In conjunction with the Community Relations Council of the United Jewish Federation of Tidewater, Simon Family JCC, and community partners’ Israel Today series, including UJFT’s Society of Professionals. A rare murder in a tranquil suburban neighborhood in the dead of winter… the body and house littered with dirt from hundreds of emptied vacuum cleaner bags… A conflicted Jewish private investigator named after a Swede who retains his sardonic wit while in search of a very sophisticated killer. It’s all there in Gone to Dust, the page-turning first murder mystery novel from Emmy award-winning TV writer and producer Matt Goldman. Goldman, whose television credits include Seinfeld, Ellen, and more, uses his talents to create a memorable, irreverent PI named Nils Shapiro who explores the cold winter landscape of Minnesota to solve a twisted tale in a sleepy, well-off suburb. 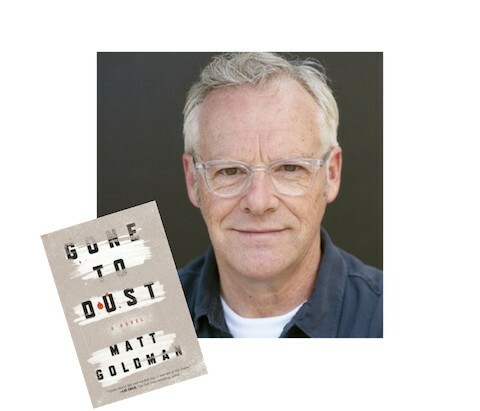 Matt Goldman is a playwright and Emmy Award-winning television writer for Seinfeld, Ellen, and others. Goldman brings his signature storytelling abilities and light touch to his debut novel Gone to Dust. He began his career as a stand-up comedian while attending the University of Minnesota before moving to Los Angeles to write full-time. His second novel in the Nils Shapiro series, Broken Ice: A Novel, was released in June 2018. The United Jewish Federation of Tidewater & the Simon Family JCC’s Lee and Bernard Jaffe Family Jewish Book Festival is held in coordination with the Jewish Book Council, the only organization in the organized American Jewish community whose sole purpose is the promotion of Jewish books. ** Register a community book club and receive the following exclusive perks: discounts on group tickets, reserved seating with book club at author events, book club mention during program welcome remarks, and a special book clubs only reception with a book club author. Please contact Callah Terkeltaub at cterkeltaub@ujft.org for more information or to register a book club.